Because of its role as the scientific justification for an expanding network of zapovedniki, a holistic understanding of the natural community or biocenosis retained its hold on Russian ecologists and field biologists longer than in the United States or other countries. Through the 1980s advocacy (support for inviolable zapovedniki as institutions) continued to be dressed up as science (biocenology, the study of ecological communities). That linkage began to weaken during the 1960s and 1970s when, first, biocenologists finally had to acknowledge that their theory and practice did not cohere; second, they recognized that the theory was out of step with international science; and third, new paradigms and institutions began to challenge their monopoly within Soviet ecological science. These challenges to the ecological community concept, in turn, presented challenges to the raison d'être of the zapovedniki, which were amplified by the growth of Soviet tourist demand for scenery. Some environmentalists sought a new scientific theoretical grounding for protected territories to supplant the shaky old one, while others acknowledged their subjective view of the zapovedniki as simply sacred space. By the late 1980s the rationales for zapovedniki focused more on their roles as protected habitats, buffers for an overindustrialized landscape, aesthetically valuable undisturbed nature, and areas where the flow of life could still go its own way. Beginning in the late 1960s, philosophers, economists, and political scientists discovered environmental rhetoric—I hesitate to describe it as "advocacy." Although each environmental writer was trying to make a name for himself (or, rarely, herself) and implicitly made claims for his or her discipline's central role in developing environmental theory, collectively these individuals represented a regime-approved and regime-sponsored means of blunting the critical edge of environmental speech. At the same time, the abundance of "environmental" publications in the social sciences represented proof of the regime's good intentions. This appropriation of environmental rhetoric went largely unchallenged by authentic activists because it also served their purposes: it confirmed environmental issues as one of the few zones of relatively free speech in the Soviet Union. Since 1910 the latter approach had been championed in Russia by Leontii Grigor' evich Ramenskii, but it had made little headway against the holistic, supraorganismic model of the biogeocenosis (ecological community plus abiotic environment) championed by Sukachev and his many allies. During the early 1960s things began to change slightly with the appearance of two important articles by V. D. Aleksandrova, which showed a certain sympathy for the continuum notion, but even they fell short of a clean break with organismic holism. 2 Soviet ecologists, particularly plant ecologists, were caught in a bind. On the one hand, they prided themselves on claiming to be an important part of international science. This logic should have pushed them to give up the holistic biogeocenosis for the more Western and relativistic "ecosystem" and for the continuum. On the other hand, they still needed a scientific justification for the zapovedniki, and in the absence of any other compelling ecological model clung to that of the biogeocenosis. However, the specter loomed of another zapovednik war like those of the 1920s and early 1930s. Repeating history, the USSR Agriculture Ministry's Glavpriroda, where utilitarians were still ensconced, sought to annex the newly created or restored zapovedniki of the Russian Republic's Glavokhota system and of other republican systems to its own, centralized all-Union network. Eerily, the issues had hardly changed since the 1930s, for Glavpriroda's reserves were still pursuing the same income-maximizing goals as before, while the Glavokhota reserves, heirs to the Kozhevnikov tradition, continued to reaffirm both the etalon mission of the zapovedniki as well as the inviolability of their regime. 4 In this reprise of the debate, ecological questions played a central role. Perhaps the most striking defense of the traditional vision of the zapovednik during the 1960s was the speech of Glavokhota's director of zapovedniki, A. Kondratenko, at the All-Union Conference on Zapovedniki on February 12, 1968. Declaring that to give a speech and pretend that the zapovedniki were no longer faced with powerful threats and impediments would be "to engage in simple phrase-mongering and empty words," Kondratenko outlined four broad areas in which the "Leninist principles of organization and management of zapovedniki" were undercut or trammeled. What distinguished these seven reserves was that they were among the most picturesque and the most accessible. Because the USSR Ministry of Agriculture's Glavpriroda had now been designated as the official Soviet "lead agency" for international contacts concerning nature protection and protected territories, there was a concern that the ministry have within its jurisdiction appropriately interesting reserves that it could show to foreign scientists and dignitaries. Not coincidentally, Bannikov's guidebook of the Ministry of Agriculture zapovedniki, complete with beguiling color photos, appeared in early 1966. 15 That infuriated "authentic" nature protection activists even more, as their foreign counterparts would be meeting with second- and third-rate scientists and bureaucrats of the Ministry of Agriculture system and would never learn of the existence of their "real" colleagues sequestered in the Glavokhota and other systems. Bannikov and others tried to play a constructive behind-the-scenes role. In August 1966 Bannikov wrote to Matskevich on the eve of the minister's trip to Tadzhikistan about the abuses in the Ramit zapovednik and the need to create a zapovednik in the Gorno-Badakhshan autonomous oblast'. 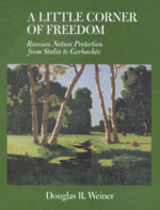 19 And Glavpriroda began work on a draft law on nature protection for the entire USSR. 20 Yet the prevailing sentiment was that sounded by Glavokhota director Kondratenko: the forces of light (Glavokhota and nauchnaia obshchestvennost') were still locked in battle with the forces of darkness (Glavpriroda and transformism). One complex of issues that still retained its emotional force was that of acclimatization and the campaign to eliminate large predators. For the scientific intelligentsia, this was an unsurpassed metaphor for the careless, scientifically uninformed, and dangerous transformism of the Soviet regime generally: chaotic capriciousness under the guise of "rational planning." It was difficult to escape the parallels in the realm of social and public policy: the "liquidation" of the "kulaks as a class," the deportation of peoples from ancestral lands to places half a continent away, the communal apartment, and other social experiments. Linkage with Lysenko and his ally Pëtr Aleksandrovich Manteifel' only deepened acclimatization's reputation as quackery and "Stalinist science." It was all the more odious that the regime had at various times forced this profane policy into the precincts of the zapovedniki. Many schemes were hopeless from the first, such as the attempt to improve the Siberian red fox by releasing Canadian foxes. Introduced animals became pests: squirrels in the Crimea, mink in Eastern Siberia (where they preyed on the muskrat, which had also been introduced from North America, but never achieved great enough density to become economically harvestable), and the raccoon dog almost everywhere it was introduced, particularly in central European Russia, where it attacked ground-nesting birds. Once the police power of the Party-state was withdrawn from the arena of biological research and teaching, geneticists and ecologists exerted efforts to decertify Stalin-era "schools" and their practitioners. Controlling scientific credentials was central to the social identity of the scientific intelligentsia and to its norm of scientific autonomy, and scientists lost no time trying to reclaim lost ground. Among conservationists, voices of qualification, such as that of G. P. Dement'ev, the new president of the Academy of Science's Conservation Commission, warned that "it was time to renounce the view that zapovedniki are a 'higher' form of conservation." Instead, Dement'ev noted that the areas the reserves incorporated were only "conditionally natural" and that the tasks of conservation transcended the preservation of natural areas and their denizens (no matter how worthy that cause). 33 However, his words went largely unheeded by the restorationists. Nonetheless, a conference called by the Academy's Conservation Commission and those of the republics, meeting at the Zoological Institute in Leningrad on January 25, 1956, revealed the incipient divergence within the ecologist-conservationist camp. Professor V. B. Dubinin, microbiologist and vice president of the Commission, emphasized not zapovedniki but resource problems in his keynote address. For the first time there was a vigorous call for the study of the ecological impacts of migrating radioactive compounds, now identified as a serious health threat to humans. 34 Articles on the ecological consequences of pollutants and pesticides also began to appear in the Commission's journal, Okhrana prirody i zapovednoe delo v SSSR. These articles represented a new style of ecology on four counts. First, radiation and pollution were human health issues, to be studied in the tainted earth and waters around nuclear test sites, reactor sites, farms, and factories, remote from the allegedly self-regulating etalony of virgin nature. Second, the analytic framework for studying the effects of radiation and pollution was the species population, not the vaguely defined community. Third, this new current of ecological research was pervaded by the optimistic supposition that nature was fully knowable and would eventually be reducible to mathematical description. Finally, adherents of the new ecology believed that each of the new, serious environmental problems confronting society was susceptible of a technical solution, in principle. This trend was reflected in new institutional arrangements, such as V. A. Kovda's Institute on Soil Science and Stanislav Semënovich Shvarts' Institute for the Ecology of Plants and Animals (established 1955), attached to the Ural Scientific Center of the Academy in Sverdlovsk, which had been fortified by waves of physicists and mathematicians seeking to apply their latest theoretical models to the study of living systems. After having helped to launch the journal Ekologiia (Ecology) in 1969, Shvarts began to speak out emphatically on the relationship between ecology as a science and resource development. In a talk at a 1973 special Academy-wide conference on conservation, he first underscored the sharp distinction that needed to be made between professional ecological science and conservation. Owing to a wrongheaded conflation of the two in the public mind, "broad circles of readers began to understand ecology as...a science with a social agenda, whose task boiled down to the protection of nature, the amelioration of the microclimate in urban areas, the development of various methods of detoxifying effluents, etc. However, speaking about ecology, it is always essential to emphasize that ecology is a biological discipline with its own...specific research methods." 47 Nevertheless, Shvarts did see a central role for ecology in addressing the environmental problems of the day. 48 But to play such a role, ecology needed to be unflinchingly scientific, abandoning all traces of muddy, idealist thinking and values. Although Shvarts' ecological engineering cannot be equated with I. I. Prezent's voluntaristic call in 1932 for Soviet biologists to become "engineers" in the great transformation of nature, there is at least one common thread: the notion that static natural harmonies do not exist. If, as Shvarts noted, ecology was "a science of the environment," then that environment has become increasingly transformed by humans. Consequently, "the most progressive ecologists see the main task of their science as developing a theory governing the creation of a transformed world." The world "could not remain untransformed," Shvarts declared, adding that such a process of transformation needed to be governed by considerations of human needs. 51 Shvarts radically diverged from his colleagues in considering the framing of economic and developmental strategies as the proper preserve of the political authorities, not of scientists with technocratic aspirations. A year before his death Shvarts participated in a series of sharp debates with the writer and conservation activist Boris Stepanovich Riabinin, a member of the Central Council of the All-Russian Society for Conservation. 52 Held during the spring of 1975 at the Academy's House of Scholars and the "Ural" Palace of Culture, both in Sverdlovsk, they marked the ultimate development of Shvarts's positions, which provided powerful ecological-scientific justifications for the prodevelopment point of view. At that time Shvarts was perhaps the best-known ecologist in the Soviet Union among the lay public. In 1979 a roundtable was held in the pages of the main hunting and conservation journal, Okhota i okhotnich'e khoziaistvo (Hunting and Game Management). The head of the Ministry of Agriculture's Glavpriroda, A. Borodin, repeated Shvarts's argument that zapovedniki were only truncated islands of natural systems and, therefore, the ecological argument that wolves were necessary for maintaining those systems' self-regulating properties was spurious. 57 More revealing, however, was the argument of Oleg Kirillovich Gusev, the editor of Okhota i okhotnich'e khoziaistvo, who accused the bulk of Soviet biologists of "losing their objectivity" and "idealizing nature" while wolves were destroying thirty million rubles' worth of agricultural stock a year. They were purveying a baseless ecological catechism. 58 Ridiculing the ecologists, Gusev suggested that they had fallen into the teleological fallacy of believing that the wolf was created in order to prey on ungulates, ungulates to eat grass, and "both, in order to testify to the glory of the wise Creator." Their "murky" theory of "natural equilibrium" was the philosophical equivalent of a Divine Plan. Starry-eyed "idealization of nature" was to be contrasted with Gusev's hard-nosed realism: "The crux is this, that with the elimination of predators their place will be taken by other factors of selection, including human beings, whom the entire course of evolution on Earth prepared for a decisive role in the evolution of the biosphere." While researching Russia's historical efforts to protect nature, Douglas Weiner unearthed unexpected findings: a trail of documents that raised fundamental questions about the Soviet political system. These surprising documents attested to the unlikely survival of a critical-minded, scientist-led movement through the Stalin years and beyond. It appeared that, within scientific societies, alternative visions of land use, resrouce exploitation, habitat protection, and development were sustained and even publicly advocated. In sharp contrast to known Soviet practices, these scientific societies prided themselves on their traditions of free elections, foreign contacts, and a pre-revolutionary heritage.